We had the unique privilege of heading out of the urban Japan jungle and into the mountains to stay with a young, organic farming couple who happen to be couchsurfers. We sought them out because we wanted to learn about their organic ways and get our hands dirty on their farm. As soon as we arrived, they made us as comfortable as possible. 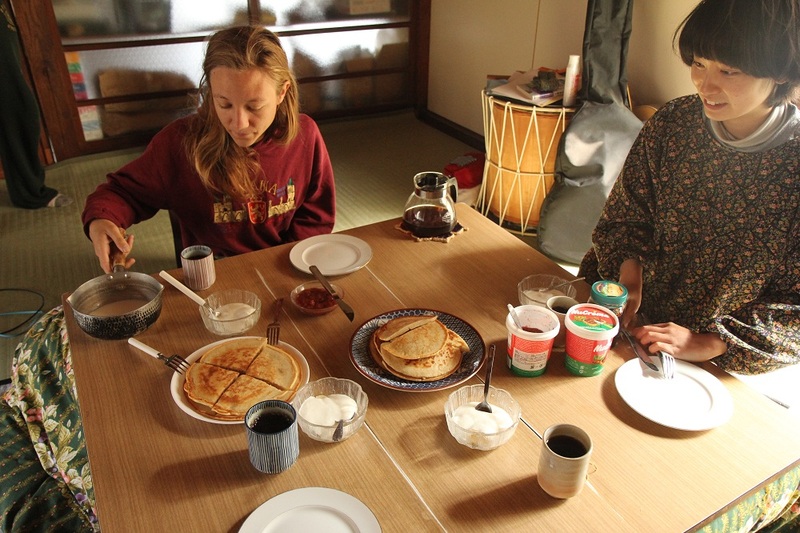 The couple is hoping to open up their farm as a bed and breakfast some day; needless to say, this was not your typical couchsurfing experience. They were the kindest, most generous folks and we were the most pampered we’d ever been in our entire lives. 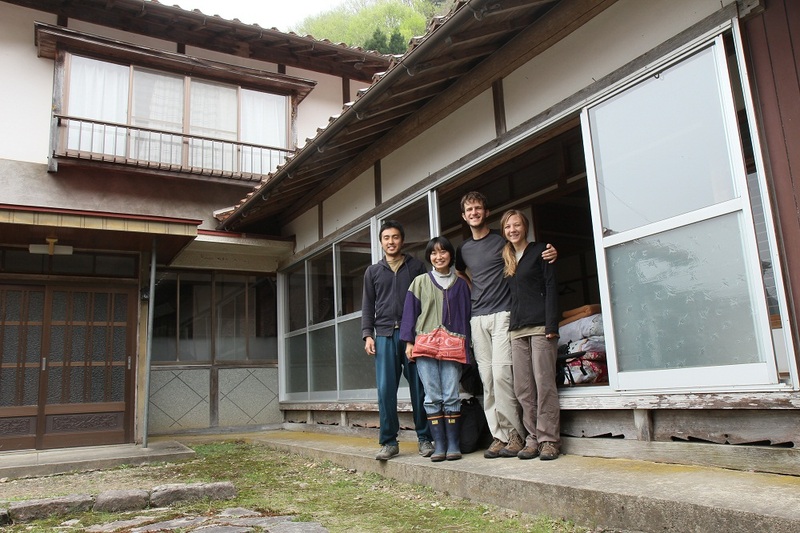 Staying at their place, we became privy to a more traditional and rural Japanese way of life. Underneath the comfortable down blankets, we slept on Japanese futons, unique because they are tri-folds. 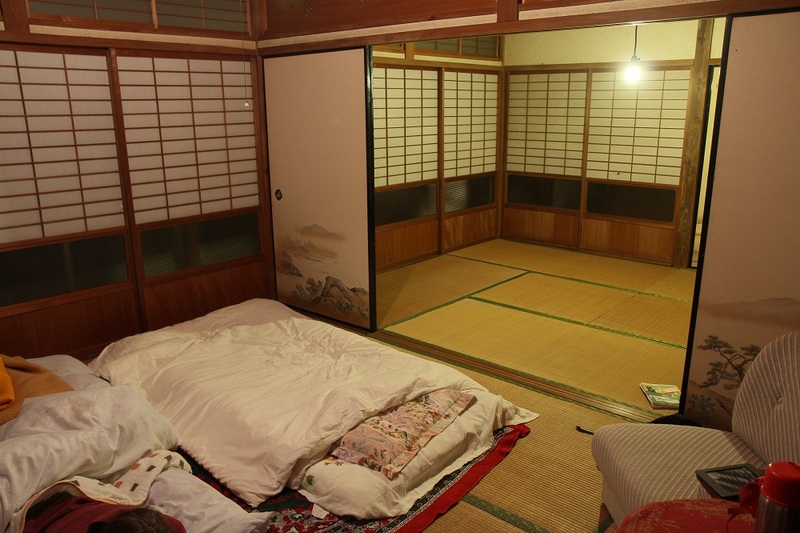 Most Japanese sleep on these futons, even older people. However, in houses the trend is changing and more and more people are sleeping in beds. The floor is covered with tatami mats (made from straw). Each mat is 6×3 feet and a typical room size is 4.5×8 tatamis. Everything is measured by tatamis. When shopping for furniture for their house, they do not measure by meters, they measure by tatamis. Another common feature of Japanese rooms are sliding doors. They’re everywhere and can instantly make a room smaller or larger, depending on your needs. Every door in the above photo was a sliding door. The outer doors opened up into a hallway that ran the length of the house. The upper part of the outside sliding doors was paper, which made for a chillier room. A far from flattering breakfast shot, I included this photo because of the awesome table. The house has no central heating. While the couple has space heaters, the most common way of staying warm is by snuggling up to this table. Underneath the table is a pit that holds hot coals. The pit is covered with slats so that you can safely tuck your legs in under the thick blanket that runs around the table and traps the heat inside. While quite marvelous, I would never be able to quell my fears of starting a house fire. 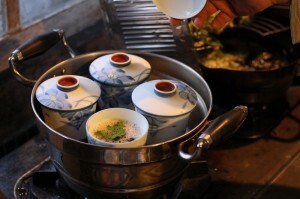 They cooked us the most delicious traditional Japanese meals (including this surprisingly tasty egg pudding – not sweet) and we drank so much green tea! Tea was served immediately upon our arrival, with every meal, and during an afternoon break. Hot water was served just before bed. While Matt spent time fixing their computer, I attempted to help them on their farm. I’m not sure if they were just being kind or if they were afraid I would mess something up, because I had to push really hard to help out! They kept saying “Relax, relax.” I am not very good at being served, especially when I don’t get to do anything in return, so I made a point of chasing them to their fields whenever they tried to sneak out of the house. They have a few small fields and we spent our time transplanting vegetables, building dirt mounds, and planting rice (not in the fields, just in trays). Miya made sure I was properly dressed for the work: a floppy hat to protect myself from the sun (Japanese women take great care of their skin; rarely have I seen them without a hat or an umbrella), a mask to protect myself from the dust (the mask is a common sight because the Japanese also wear them when they are ill so as not to get others sick… SO conscientious! 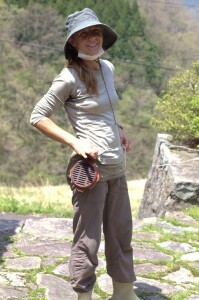 ), and a smoking device worn around the waist to protect myself from the mosquitoes! Akhiro was kind enough to take us fishing later that night. It’s a good think we weren’t fishing for dinner because he was the only one who had any luck. The best part of the day was sharing conversations over meals. They explained that they farm half of the year and then head north during the winter to help with tsunami relief efforts and to assist Akhiro’s father on his strawberry farm. We discovered that the average age of a Japanese farmer is in the sixties! 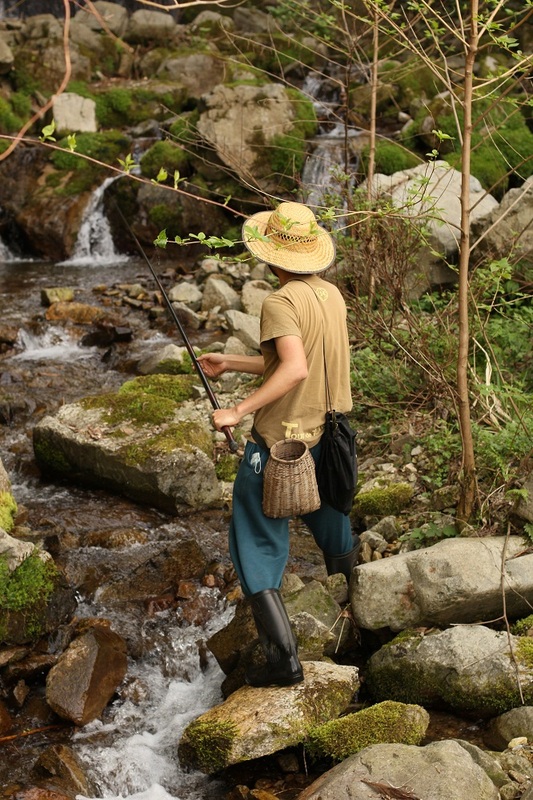 As Japan’s population continues to dwindle and farming continues to be an unpopular way of life, one can only wonder what this culture will do in the not so far future. Written by: kate on April 30, 2012.on May 11, 2012.